Start on a Saturday if you want to begin the diet on a Monday. Download the 4 Day Intro Menu. This will give you instructions on how to begin. The foods above are just a suggestion and not a hard and fast rule to what can be done with the foods suggested in the first stage of the diet. Cheeses and yogurt can be introduced at any stage if your stomach can handle it. For most, introducing yogurt should be done a little at a time as suggested in the Breaking The Vicious Cycle book. And for some it might be beneficial to only start introducing dairy at the second stage of the diet. It is important to be aware that the timing for the introduction of new foods in the various stages of the diet is up to each individual. Some might need a little longer on the intro diet than others. Most people have been suffering for years from their digestive disorders and slow introduction of new foods is advisable and each individual has different reactions to new foods. It is important to monitor your reaction to new foods. Give each new food a few days to see if it agrees with you. For me it took 12 months before I could get to the 5th stage of the diet and still to this day am eliminating some foods as they do not agree with me. 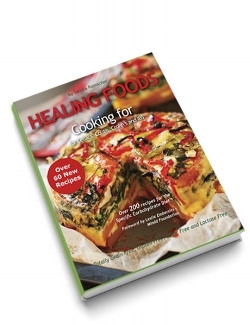 I am more than happy to forward the recipes for the above 4 days of intro diet for those of you who don’t have ‘Cooking For Celiacs, Colitis, Crohn's and IBS’. Visit the Pecan Bread website for an extremely helpful insight into the beginning stages of the diet. The website is in support of the Specific Carbohydrate Diet (SCD) in use for children with autism but is absolutely relevant for anyone with digestive disorders and the use of the SCD.